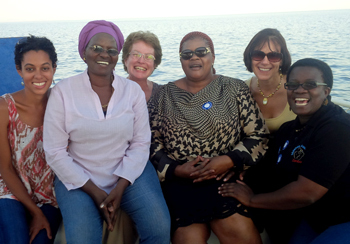 Left to right: Lauren Arrington, CNM; Ruth Muzumala; Wreatha Carner, CNM; Rhoda Amafumba; Tina Johnson, CNM, MS, ACNM Director of Professional Practice & Health Policy; Sarah Ngama. organizational effectiveness, relationship building, networking and solidarity. acceptable, and high quality midwifery care. If you are interested in applying for a TAZA twin in Zambia, please complete this application. To learn more or to exchange ideas, visit the TAZA Midwives facebook page or subscribe to the International Discussion List (ACNM members only). For more information, contact Wreatha Carner at [email protected].